In 2006 AfH recognised that a schism had developed between the academic community and practicing healthcare architects and as a consequence, the image of healthcare design had fallen amongst students. 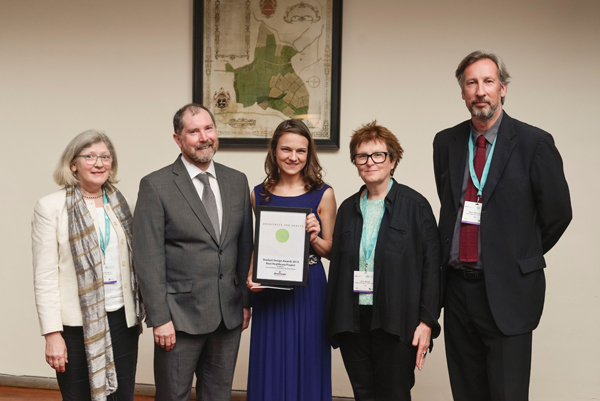 So AFH established an annual award for student design to celebrate the opportunities for student work within the gamut of healthcare and social care topics. Each year since then, AfH has helped to rebuild the relationship with academia and subsequently improve the quality of design within the sector. Next year we look forward to celebrating the 10th year of our initiative. In 2015, AfH worked in studio with two London schools: LSBU and Chelsea to develop ideas for placemaking in healthcare settings and the city. Executive members of AfH engaged with the teaching teams to build a platform for discussion and exchange. Each school devised and developed their own brief around the topic and then one student from each school was selected by AfH with the tutors as this year’s winners. 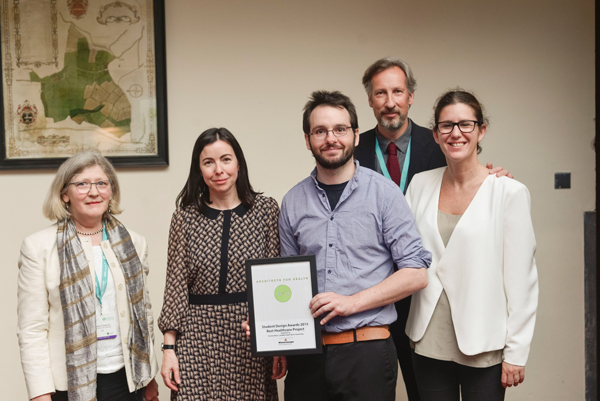 The prizes were awarded at the European healthcare Design Congress in June 2015. 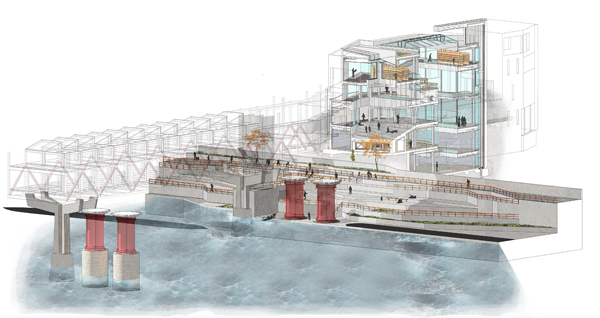 Charles Rose (Year 3 student) at London South Bank University designed a research centre in Blackfriars. The proposal demonstrates an excellent response to brief and context; context being both a debate about health, particularly health in the city which we asked students to address, and also context in relation to the difficulties of creating a building within a demanding site in Blackfriars London, adjacent to the river Thames. Charles cultivated a strong theoretical position to health to create a self-evolved brief. His proposed project followed a rigorous investigation of the site context, constraints and opportunities, and was represented in a very thorough, rich, final presentation that included strong info-graphics, plans, sections elevations and 3-D models of a building of commendable architectural interest. Tutors at LSBU Carla James + Catriona Burns – Studio 1 LSBU. Polina Andreeva at Chelsea was asked to design for a site at St Thomas’ Hospital as part of the MA in Interior and Spatial Design. 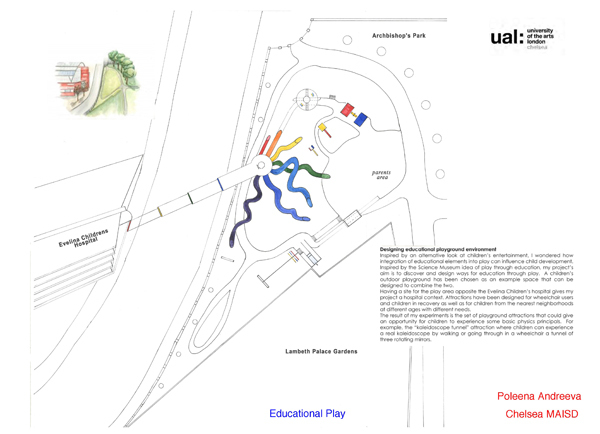 Polina Andreeva’s research engages the spatial aspects of child development, and she has designed an innovative outside play area for the Evelina London Children’s Hospital. Inspired by the Science Museum, this multisensory environments combines physical discovery (the effects of colour or gravity) with some basic scientific principles around visual and tectile perception. This sense of play is also captured by the spirit of her constructivist inspired drawings.